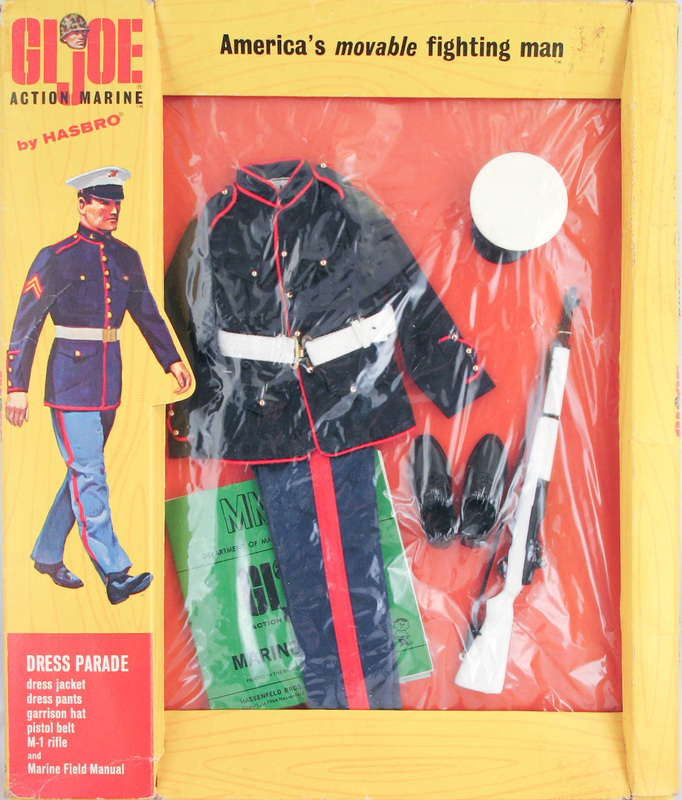 The Marine Dress Parade set (7710) may be the most ubiquitous set in military era footlockers. There are several variations on the turntable above, which are shown individually below. 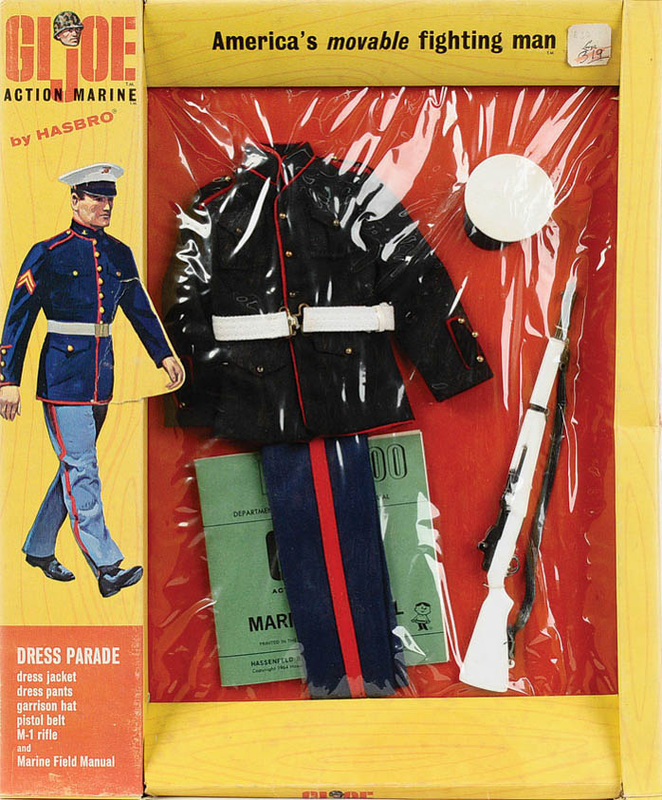 The earliest issue of the set (above) did not come with dress shoes. 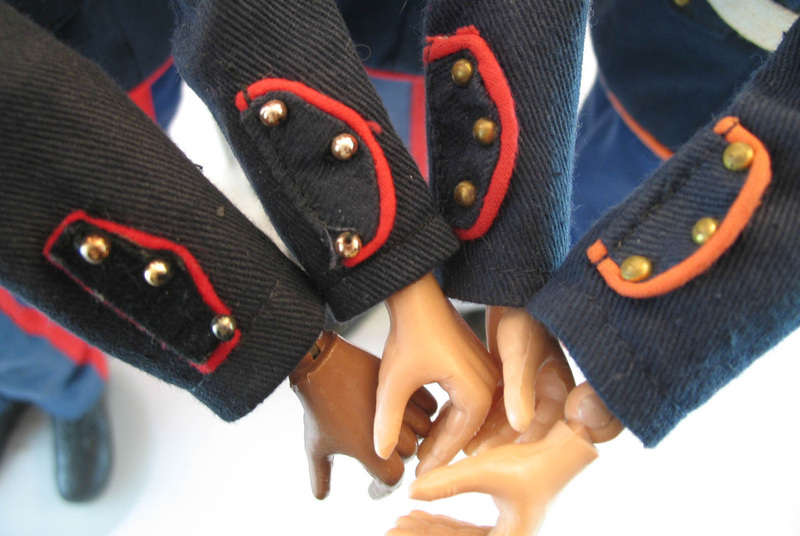 The epaulets and cuff flaps are made of felt and glued to the jacket. The cap was made of soft rubber which shrinks and hardens, which is why the cap above looks a bit small. Above, an early issue window box (image courtesy Vectis Auctions Ltd.) featuring a felt cuff example of the jacket and no footgear. Below, a later R/TM window box with added dress shoes. A beautiful 1968 photo box, courtesy of fellow collector Wenty35. Thanks! 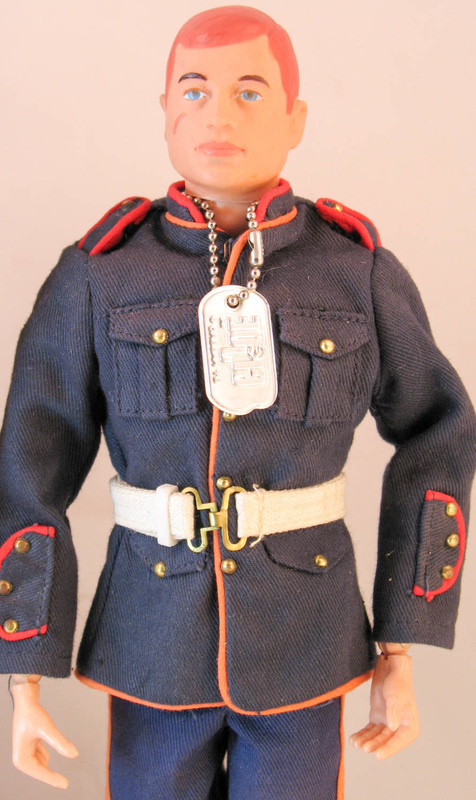 The most common version of the set has the epaulets and cuff flaps made of the same material as the jacket. Dress shoes began to be issued with the set. The buttons, made from tiny gold beads, are the same on these earlier sets. 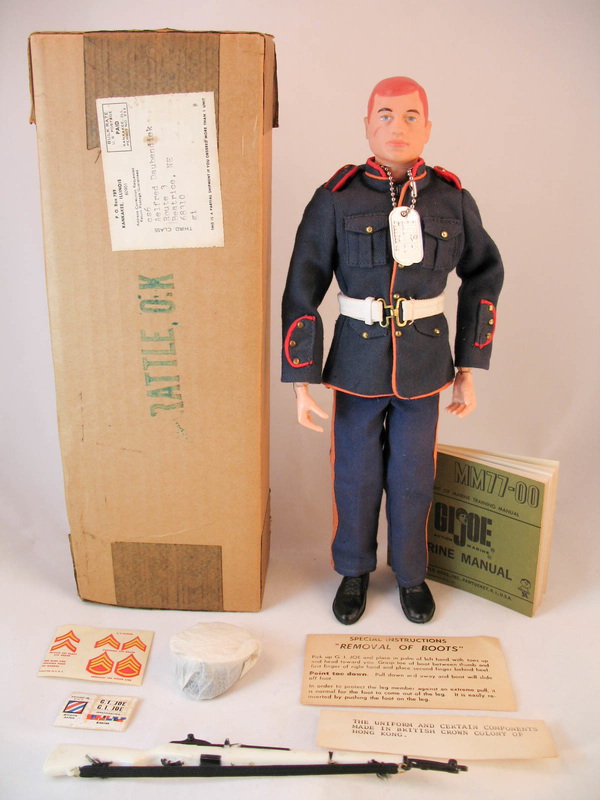 The sets above and below are so called "Kelloggs" Marines, so-named because they were available as a mail away cereal premium. It appears that these were actually premiums from Post brand cereals. This set also appeared in 1968 photo boxes. It differs from the above versions with the addition of brass buttons rather than beads. The caps on these later sets are made from a different vinyl or rubber and tend to stay soft. The caps are marked Hasbro Hong Kong, where the earlier caps are unmarked. The paint of the gold emblem reacted with the rubber, so the cap badge is usually green on the late caps. Below, the mailing box and contents for the 'Kelloggs' set. Note that this example mixes the proper red piping with factory substituted orange piping on the edge of the jacket and pant legs. Note that the white rifle shown below may not have originally come with the set. It is not mentioned in the Post ad, so may have been a later addition. The set above is an interesting variation; the Hong Kong factory substituted orange fabric for the piping, rather than the correct red. 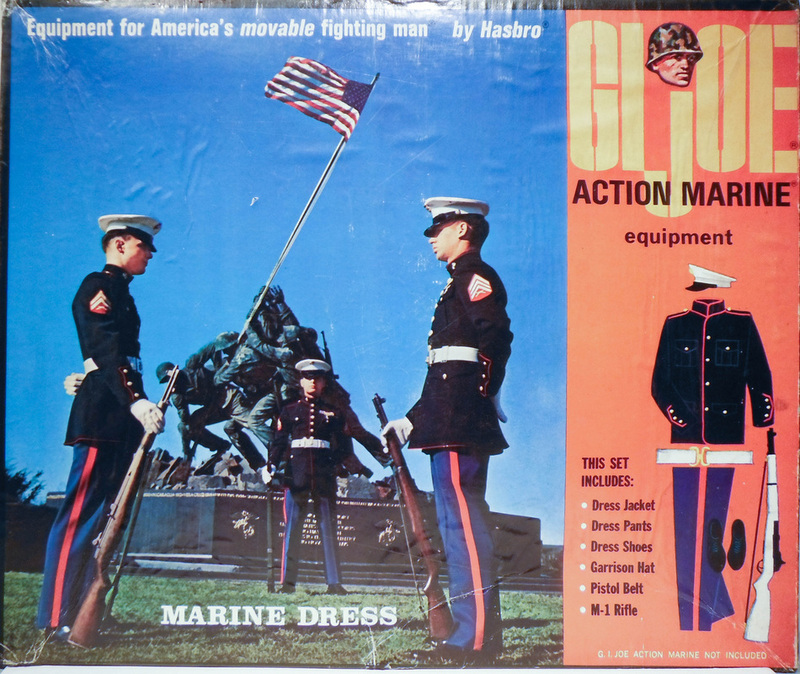 From left to right: the early issue felt cuff version, the standard version, the later issue brass button version, and the variant with orange piping. Lots of variety to chase, even in this common set!